The Aspen Mountain Log Futon Chair and Ottoman is made from aspen logs harvested from sustainable forests in the Rocky Mountains. Environmentally friendly, all logs are harvested from dead-standing aspen trees. The aspen logs used to make the rustic futon chair and ottoman are hand peeled so as much of the natural beauty and character of the logs are left as is possible. 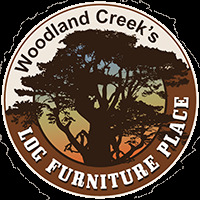 The aspen log futon chair and ottoman are constructed using mortise and tenon and then glued and screwed for added strength and longevity. This ensures heirloom quality craftsmanship. The futon chair is then hand sanded and rubbed with a beeswax and linseed oil finish to bring out the natural beauty of the wood. The finish may be upgraded to a bronze aspen finish for a darker look. The Aspen Mountain Log Futon Chair and Ottoman will look wonderful in your log cabins and rustic lodges. This rustic log futon chair will also look great in a country cottage or western ranch. Standard or Extra Gnarly Character. Clear or Bronze Aspen finish. Constructed using mortise and tenon and then glued and screwed.